Jessica Simpson lip injections | Before and After Plastic Surgery Celebrity 2011 cosmetic surgeries prices. Jessica Simpson: 2004 vs. 2007. Holy crap. Ummm, Jessica Simpson has looked better. That's as nicely as we can put it. This was before she got fat, too! 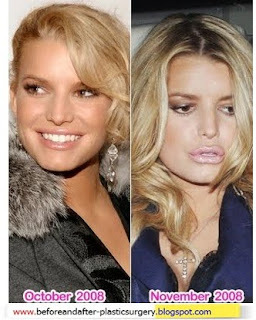 Here we have a prime example in Jessica Simpson of why not to get lip injections, because of the dreadful trout pout that rears its ugly head in so many cases.